Fri, Nov 9, 2018, 08:14 pm SL Time, ColomboPage News Desk, Sri Lanka. Nov 09, Colombo: On Sunday 11th November the 100th anniversary of the signing of the Armistice that brought hostilities in World War One to an end will be marked at ceremonies around the world. The British High Commission in Colombo will mark Remembrance Day with a commemoration ceremony at 4.00pm at the Liveramentu Commonwealth War Graves Cemetery in Colombo. The simple ceremony will include readings and prayers. As is customary, buglers from the Sri Lanka Army will play "Last Post" and "Reveille" at the beginning and end of two minutes silence, and wreaths will be laid. The act of remembrance will be attended by representatives of the diplomatic corps, representatives of the War Veterans' Association of Sri Lanka and of other Sri Lankan organizations, and by members of the British and other Commonwealth communities in Sri Lanka. "More than four hundred Sri Lankan servicemen lost their lives in World War One, a conflict the effects of which were felt around the globe. It is estimated that the total number of military and civilian casualties in the conflict was around 40 million people. At the eleventh hour of the eleventh day of the eleventh month of 1918 the war was formally brought to an end," commenting on the event, the British High Commissioner to Sri Lanka, James Dauris said. "The custom each year of remembering women and men who have died in the service of their country is one that has continued since then. 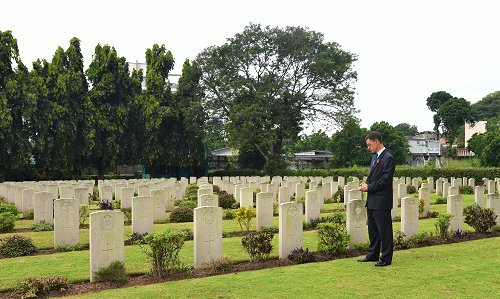 More than two thousand Commonwealth soldiers, sailors and airmen are buried in Sri Lanka's six Commonwealth War Graves. The majority of them died in the service of their countries and for freedom in the Second World War, a global conflict in which servicemen and women from Ceylon served bravely. "These days we remember the many servicemen and women who have given their lives not only in the two World Wars but also in many other wars that have taken place around the world more recently. "Remembrance Day is an occasion to reflect on loss and sacrifice, and also on peace and reconciliation. Remembering those who have died helps us not to forget what they died for or the cost of conflict. Not forgetting helps us to keep in mind how precious peace is and how much it is worth striving to maintain."